Summary: Starr Carter leads a double life, attending a wealthy white-dominated private school but living in a poor urban neighborhood. But her life changes one night when she witnesses her friend Khalil getting gunned down by a police officer. You know this story because you've read something similar in the news many times: a person of color gets killed or brutalized by a police officer and immediately the narrative begins to unfold in the media about how the kid was a "thug" and he "deserved it," even though he was unarmed and just a kid. 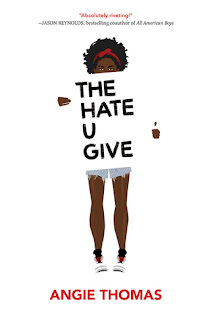 In THUG, Starr finds herself no longer able--or willing--to keep those two sides of her life separate because she is suddenly at the center of a national news story, and it starts to become unbearable to be "respectable Starr" when she is filled with grief and anger. As the only other person who knows what happened that night, it's up to Starr to decide whether or not to speak up, even knowing that there are plenty of people who are unwilling to listen. Thoughts: I don't know what I could say about this book that would do it justice. I definitely knew it was going to be a big deal before it came out, and I didn't read it right away after it was released (because I wanted to give it the proper respect and attention it deserved), so I knew from other people going into it how good it was, how important it was, how necessary it was. Or, is, I should say. I don't think I'm exaggerating when I say that this book is our generation's To Kill a Mockingbird. This is a book with the potential to change the world, if only we could get everyone to read it and process it. As I said above, you know this story already because it's an unfortunately common story. Inspired by the Black Lives Matter movement, THUG is a story narrated by Starr, but in truth, every point of view you've probably ever heard appears in this story, from the people who knew the victim best, to people like Starr's Uncle Carlos, a detective who works with the officer who shot Khalil and who got out of the hood, to Starr's prep school friends and boyfriend (for example, Hailey, the tone-deaf white girl who cracks racist jokes but thinks YOU are creating the problem when you call her out on it). Angie Thomas doesn't leave anyone out, doesn't leave any point of view unaddressed, and this is important. It is SO important that we see each and every side of this dialogue addressed, because Thomas also addresses the impact of each person's comments as well, and how they affect Starr. Thomas said in an interview with Cosmo: "I’ve always been a huge Tupac fan and I often listen to him for inspiration or when I’m stuck. When we were trying to figure out a title for the book, I came across a YouTube clip of him discussing THUG LIFE. Everybody knows that as the tattoo he had, and recently it's become a funny thing on the Internet where somebody does something bad and you holler out, "Thug life!" But when I saw him explain what it means, it hit me that that’s not just in my book, but that's what we see in society. When these unarmed black people lose their lives, the hate they've been given screws us all. We see it in the form of anger and we see it in the form of riots. So when I saw that in the video, it was like a sign." This book is so important. SO IMPORTANT. And I don't just recommend it, I consider it necessary reading. If I could teach this book, I would. If you care at all about making this world a better place, you need to read this book. And if you don't care, then you ESPECIALLY need to read this book. And start caring.